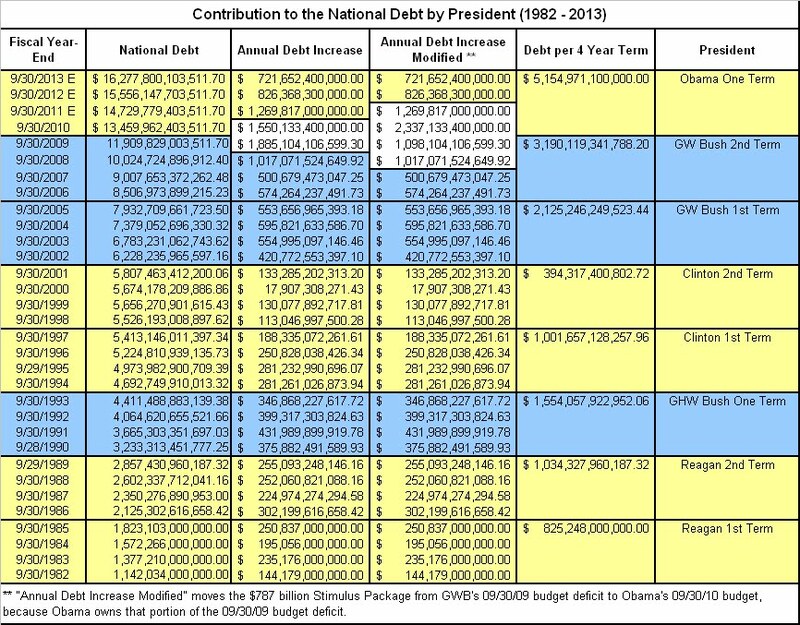 In analyzing the contribution to our National Debt by President (see table below), my initial idea was to determine the actual cost of each annual budget deficit, over time, by utilizing the Rule of 72, along with current and future interest rates. Since our debt has traditionally never been repaid, the future value of each deficit doubles roughly every 18 years, using an average interest rate of 4.0%. Although I found this to be sickening enough, what’s even more striking is the progressive pattern of reckless spending under the last five administrations. 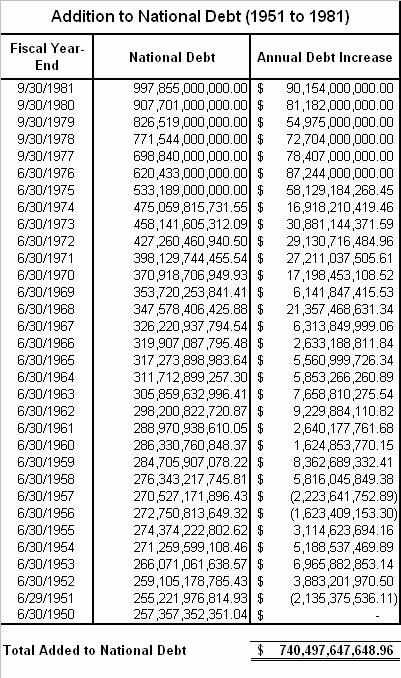 What’s striking is the fact that only a total of $740.5 billion was added to the Debt between fiscal years 1951 through 1981 (see table below). Although I consider myself to be a Reagan conservative, his record on deficit spending was horrible. During his two terms in office, Ronald Reagan is partly responsible for adding $1.86 trillion to the Debt. George H. W. Bush, as a one-term president, was partially responsible for adding $1.55 trillion to our Debt. H.W. nearly surpassed Reagan in half the time. Bill Clinton is often touted as having run budget surpluses during his second term in office, however, this is mostly attributable to a Republican lead Congress. But even Bill Clinton overspent, and in the end would run up the Debt by $1.39 trillion during his eight year term. George W. Bush exploded the Debt by $5.31 trillion over 8 years. Although I would come to trust GWB with my life, I wouldn’t trust him with my wallet. To be fair, I have deducted Obama’s fiscal year 2009 addition of $787 billion for his failed Stimulus program, and I added it to Obama’s 2010 deficit. I would also attribute $2.1 trillion of Bush’s $5.31 trillion in red ink to Nancy Pelosi, and the majority Democrat Congress. Then we come to Barack Obama. Obama is projected to advance the National Debt by $5.15 trillion in his first (and last) term in office. Obama will go down in history as the most fiscally reckless president of all time, adding as much to the Debt in 4 years as Bush did in eight. Why would anyone even consider a 2nd term for Obama? Barack Obama represents not only ‘more of the same’, but Obama has earned the nickname, ‘Double Bush’. That’s right, in fiscal matters Obama is twice as reckless as George W. Bush, not to mention twice as dangerous in terms of national security. The American people are too smart and too unforgiving to ever consider giving Obama a second chance. Sorry Barry, you blew it. What really irks me about the first table is the addition of $5.72 trillion to the Debt between the fiscal period beginning October 1, 2007 and ending September 30, 2011 (highlighted in white). This can be mostly attributed to the current Democrat Congress led by Nancy Pelosi. Sorry Nancy but you’re gone. And sorry to most of you coming up for re-election in 2010, but you’re done too. Those who realized the error of their ways have wisely dropped out of the race. To those of you who are complicit, and still trying to hang around for another term, my only advice is to spare yourself the embarrassment. Where was it that the buck stops again? So there you have it, I have pierced Obama’s ‘echo chamber’ once again, in hopes of exposing his insular ‘death spiral’. My goal is to inspire you to elect more responsible politicians in all of the upcoming races. I like how you broke that down. It made it easy to follow. Well done. Thank you Mike K. I'm trying.